I designed this afghan for several knitters of different skill levels who wanted to create a special item to raffle off for the benefit of Bangtail Dog Rescue, a dog rescue based in Stevensville, Montana, that specializes in rescuing deaf dogs. This afghan will be able to help the rescue in two ways. 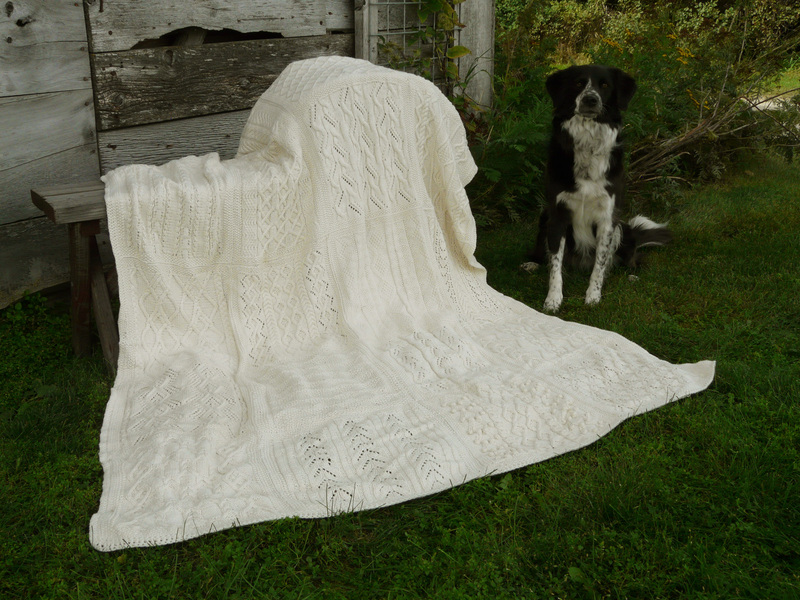 The completed afghan will be raffled off during the fall of 2013 and a portion of the sale of this pattern will go directly to Bangtail Dog Rescue as well. After adopting a deaf Border Collie, Jackie Loeser and Dave Cowan began to realize just how many deaf dogs were in shelters looking for homes. In 2000, they founded Bangtail Dog Rescue specifically to help deaf dogs, especially the herding breeds, and other at-risk dogs. In the last 13 years, Jackie and Dave have helped more than 200 dogs find happy forever homes. Congenital Deafness in Dogs, How Does It Happen? There are two genes that can impact auditory function in dogs, and to a lesser extent visual function—the piebald and merle genes. Nearly 90 dog breeds have been identified with congenital deafness. In most of these, the deafness is heredity, and for nearly all it is associated with piebald or merle. Piebald, which is present in the Dalmatian, Bull Terrier, Boston Terrier, Cocker Spaniel, Jack Russell Terrier, Chihuahua and others, is a recessive gene. The piebald gene produces areas of white by suppressing pigmentation cells (melanocytes). Merle, which is present in the Shetland Sheepdog, Australian Shepherd, Border Collie, Dachshund, Great Dane and others, is a dominant gene. Merle produces a color pattern where patches of color are diluted or absent (white), again by acting on melanocytes. A homozygous (or “double”) merle is one with two copies of the merle gene, and this severely impairs its ability to make pigment, leaving large areas of the dog pigmentless (white). Pigment is necessary for certain parts of the body to function correctly, including hearing and vision, so the lack of pigment can cause health problems. Deafness results when the pigment gene is strongly expressed, not only suppressing melanocytes in skin and hair follicles, but also in a specialized vascular bed in the cochlea known as the stria vascularis. Suppression of strial melanocytes causes degeneration of this tissue, in turn causing death of hair cells in the cochlea, the nerve cells that detect sound, which results in deafness. Dogs carrying piebald or merle can be deaf in one (unilateral) or both ears (bilateral), but in a given ear the deafness is nearly always complete. Deafness is often, but not always, accompanied by blue eyes—strong gene expression also suppresses melanocytes in the iris, eliminating the brown pigment. However, not all blue-eyed dogs are deaf. Additionally, the double merle gene can also cause eye deformities. This is because the location of the eye cells in an embryo happens to be the same place that pigment starts to appear. If there is a problem with the pigment, this can therefore affect the development of the eyes. Problems include irregularly-shaped pupils, subluxated pupils (not positioned in the right place), microphthalmia (abnormally small eyes, usually with impaired vision), and other, less visible abnormalities causing bad vision or blindness. Because this type of deafness is congenital, careful breeding can eliminate the chances of having deaf offspring. In simple Mendelian genetics, each dog carries two copies of each gene, one from each parent. In the case of dogs with the merle gene, breeding two merles will result in a 25% chance of deaf offspring. Good breeders are careful about their breedings to ensure they do make this mistake. Why Have a Special Rescue? Deaf dogs are typically not easily placed due to their disability, which many potential adopters see as a difficulty. Consequently, deaf dogs may end up in the shelter for much longer than their hearing counterparts. Like other dogs, deaf dogs sometimes find the shelter environment stressful and occasionally develop OCD-type behaviors to cope with the stress, making it even harder to find them a home. And that is where Bangtail Dog Rescue comes in. Bangtail Dog Rescue networks with other rescues and shelters around the country to help deaf dogs needing homes. Jackie takes in dogs from shelters, rescues and high-risk situations to provide them with the level of attention they need to help them find a good home. But Isn’t It Hard to Have a Deaf Dog? Deaf dogs are actually no harder to train than hearing dogs. Hand signals are used in place of words and deaf dogs respond very well to positive training methods and can even be clicker trained. Many deaf dogs compete in obedience and agility, while others are very successful in therapy work. Additionally, Jackie and many other deaf dog owners have found that deaf dogs pay better attention to where their owners are, negating the need to “call” them back, so off-leash work is still possible. Although Bangtail specializes in deaf dogs, Jackie also tries to help other dogs in need. When space allows and the need arises, Bangtail helps other shelters in the West that have limited space and resources with their overflow. Bangtail also works to educate the public about deaf dogs and what wonderful pets they can be. Bangtail Dog Rescue strives to match the right dog with the right people. Jackie’s goal is to have every one of her dogs get a great home and stay there for life. Jackie is a Certified Professional Dog Trainer and is available to help new adopters with training and behavior advice. For more information on Bangtail Dog Rescue, rescuing a deaf dog or to see a list of currently available dogs, please visit www.blackdog.cc. Bangtail Dog Rescue is a registered non-profit. All donations are tax deductible and go directly to the care of the dogs including spaying, neutering, general vet care, food, blankets, toys, and transporting dogs to their forever homes.